The other night I was given the task of cooking dinner with chicken and whatever else I could find in the house. 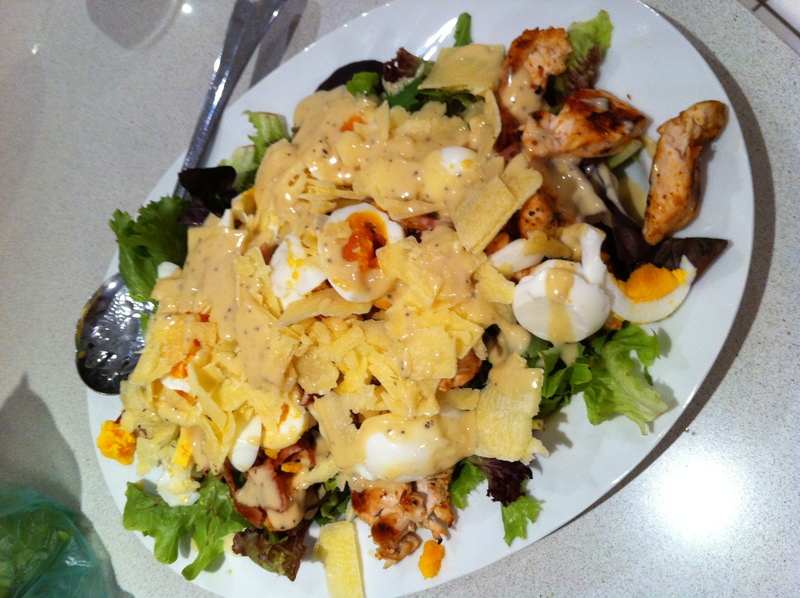 I managed to find some bacon, lettuce, eggs, Parmesan cheese and Caesar salad dressing so decided to make a chicken Caesar salad. The Caesar salad dressing I used was Cardini’s (one of the only gluten free Caesar salad dressing I could find) which you can get in Coles. All you need to do for the salad is firstly toss the chicken in peri peri seasoning and then cook. Hard boil the eggs and fry the bacon. On some lettuce leaves (I didn’t have cos lettuce so just used mixed leaves) place the sliced boiled eggs, sliced bacon, chicken, shaved Parmesan and dressing. The salad is a great, quick lunch or dinner option. MMMMMMMMMMMMMMMMMMMMM,..what more can I say?? ?